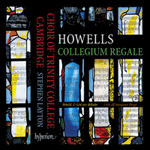 It is a long way from the complexity of Howells’ mature style to the pared down simplicity of the Anglican chant, that formulaic sequence of twenty or so chords into which, in the right hands, the verses of Coverdale’s psalter seem to find their perfect musical expression. Howells was not a major contributor to this repertoire, but the examples recorded here—Psalms 121 and 122—possibly dating from as early as his student days at the RCM, have just the right balance of fulfilled and confounded harmonic expectation to bear the repeated hearings that the form demands, and justify their place with the very best. I will lift up mine eyes unto the hills from whence cometh my help. My help cometh even from the Lord who hath made heaven and earth. He will not suffer thy foot to be moved, and he that keepeth thee will not sleep. The Lord himself is thy keeper; the Lord is thy defence upon thy right hand. So that the sun shall not burn thee by day, neither moon by night. The Lord shall preserve thee from all evil; yea, it is even he that shall keep thy soul. The Lord shall preserve thy going out and thy coming in from this time forth for evermore.